What is it? 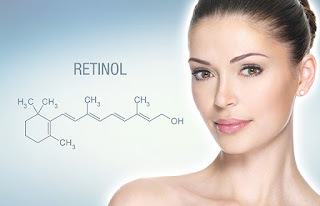 Retinol is simply another name for vitamin A. It’s commonly referred to as a retinoid. Vitamin A is one of the body’s key nutrients for fighting cell damage. It is an antioxidant that normalizes cell turnover and works as an anti-inflammatory to help acne; as well as fight the visible signs of aging by addressing free radical damage. There are many natural and synthetic (prescription) forms of retinoids; such as retinoic acid, retinyl palmitate, and retinaldehyde. What are they used for? Retinoids are truly transformative and when used regularly they promote skin renewal, brighten the skin tone, reduce acne, and stimulate collagen & elastin production. I personally have noticed a difference in the texture around my eyes, no eye cream has ever worked on the bumpy surface, but the use of retinaldehyde has smoothed out any unevenness on my skin. How do they work? Retinoids are cell communicators. They actually affect gene expression and enhance collagen level. Retinols work by "telling" the cells to grow at a faster rate, bringing fresher, more youthful skin to the surface more rapidly. The increase of new skin cells push oils and dead skin out of blocked pores preventing the formation of new blackheads and whiteheads therefore effectively treating acne. A popular misconception is that retinoids are exfoliants and that they thin the skin. They do not. In fact, because it promotes collagen production and new cell growth, it can actually thicken your skin. Vitamin A products can cause redness and flaking when you are first using them, which can be confused as exfoliation, but it is just a temporary side effect. After a few weeks your skin cells adapt and begin to tolerate it. Many retinol products also contain exfoliants like AHA's and BHA's which then are mistakenly attributed to the retinoid ingredient. Retinoids do not increase your risk for sunburn. They do, however, break down in sunlight and become less effective so always apply a broad-spectrum sunscreen rated SPF 30 or greater. If you aren’t diligent about sun protection, even the most effective anti-aging ingredients won’t be able to deliver the results you want. Unprotected sun exposure is simply bad for skin. Prescription vs OTC? Non-prescription retinoids deliver amazing benefits to the skin without the potential side effects that prescription ones may cause. Dermatologists often recommend a gentler form of vitamin A for people with sensitive skin. Studies saw a significant decrease in wrinkles after about six months of use, but even better results were yielded up to a year after the start of application. Over time, retinols help boost collagen and thicken the deeper layer of skin where wrinkles begin to form, so long-term consistency will be worth the results. Q: Why is using just water on your face not enough to wash it? A: Sometimes it is, but most of the time we need a little more help. Let me explain why. Your skin has a protection barrier called the acid mantle that is made up of your body’s natural oils and moisture. It is slightly acidic with a pH of 4.5 - 5.5. Both the acid mantle of the skin and its pH are vitally important in keeping your skin healthy. The acidity of your acid mantle helps to protect against bacteria and environmental pollutants, as well as hold in lipids and moisture. On the pH scale the difference of 1 number is to the power of 10 (4 is 10 x’s more acidic than 5; 3 is 100 x’s more acidic than 5; 2 is 1000 x’s more acidic than 5). Water is a 7 on the pH scale, a pH that is 1.5 - 2.5 higher than your skins pH. Meaning your skin is dramatically more acidic than water and that washing with water alone still disrupts the acid mantle and can leave the skin dry and vulnerable to external factors. Those who have dry, dehydrated, or mature skin may not want to wash in the morning (assuming they went to bed with a clean face). Dry skin produces less oil, so washing the face in the morning may unnecessarily strip away whatever has developed of the acid mantle during the night and compromise the barrier on the skin. Just rinsing the face with water and then rebalancing it by applying a moisturizer can be a more beneficial morning routine. Another possibility (and my preference) would be use a milky cleanser in the morning. Milky cleansers help keep the skin pH balanced by leaving a moisture barrier down to restore the skin to a more normal state. For all the rest of us, we need to wash our face twice a day. Excess oil production and dead skin cells block the pores and need to be removed regularly in order to keep the skin functioning properly. If you are acneic it is even more imperative that you cleanse twice a day because your skin produces more dead skin cells than the average person so washing assists in removing the surplus and helps prevent breakouts. The use of treatment products at night, like benzoyl peroxide, acids, or retinols, can have adverse reactions if worn throughout the day so you want to remove those and start the day off with fresh, clean skin. If you have eczema, acne, or rosacea, using a medicated cleanser will actually do more for your skin than not washing at all! The temptation to scrap it all and only use water is a direct result of using products that are too harsh for the face. Many cleansers are highly alkaline and many topical products are extremely acidic, especially those for acne or anti-aging. Skin that is too alkaline cannot protect the body against bacteria, which leads to breakouts and water loss. Products that are too acidic permeate further into the skin causing burning and irritation. When high alkaline cleansers or products that are too acidic are coupled with other irritants like sodium laurel sulfate or menthol, either in the product itself or applied after, it causes even more damage because the disrupted acid mantle allows the irritants to penetrate deeper into the skin. Most of us are not getting that dirty throughout our normal day so quit being so rough on your face! Your skin does not have to be “squeaky-clean.” Using countless exfoliating creams, scrubs, and brushes (even those fancy, expensive ones that spin and vibrate) on a daily basis breaks down the skins protective barrier causing your skin to become over sensitized making you react to every product that touches your face. When looking for a cleanser keep in mind that cleansers that foam up are for oilier skins and milky/creamy cleansers are for dryer skin types. Milky cleanser will not be enough to sufficiently cleanse oily skin. Foaming cleansers may be too harsh and stripping for those who have dry skin. Everyone should wash their face for 30-60 seconds so that the cleanser can properly remove any dirt and makeup from the face; as well as allow for any active ingredients time to penetrate and do their stuff! If you feel like you have tried everything and have given up or are afraid to try something new I would suggest you see an aesthetician. A well-trained aesthetician knows ingredients, understands the pH scale in regards to the skin, and knows how products affect the skin. 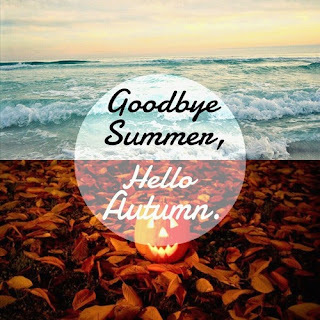 An aesthetician can help you get back on the right path to great skin. It's time to Spring Clean your skin! Winter does a number on our skin. If your complexion is looking drab, dry, and flaky it is time to spring clean your face! During the winter months central heating, cold temperatures, lack of sunshine, and extra make-up can contribute to blocked pores and dry, flaky skin. Switch up your skin care routine and combat your winter worn skin with these 2 easy tips. 1) Replace your regular cleanser for a more deep cleansing face wash. 2) Add an exfoliant to get rid of the dead cells that build up on skin’s surface (adding years to your appearance) and revealing the fresh, glowing skin that’s hiding beneath. 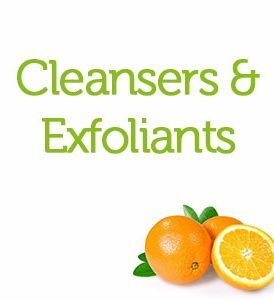 Follow me on Facebook and Instagram throughout April to learn more about different cleansers and exfoliants for The 30 Day Big Spring Clean! Each day I will focus on a different product or method and tell you all about its wonderful benefits! I recently signed up to be a source for Help a Reporter Out. It is an online service set up for journalists to obtain advice and quotes for stories they are covering from people who have expertise or experience in particular issues. I receive daily emails with source requests relevant to my industry. A few days ago one came in that was right up my alley. They wanted to know: "How can a beauty beginner create their perfect skin care routine?" 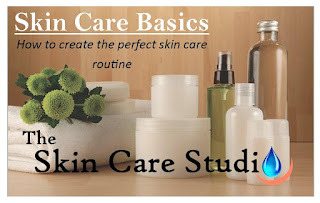 More specifically what are must have products in a routine; how to determine what ingredients to use; and most importantly HOW to use skin care products! Helping people understand how to better care for their skin is not only my business motto, but my passion. Here was my response. How many products do you need is a Skin Care Regime? I tell my clients that there are only 3 products that are absolutely needed: 1) A Good Cleanser: Meaning it is for your skin type and condition. You must wash for face for 30-60 seconds so that it has time to do it’s stuff! (Cleansers that foam up for oilier prone skins and milky/creamy cleansers for dryer skin types.) 2) A Treatment Moisturizer for Night: Your body repairs itself at night while you sleep so you might as well use that time wisely by using a moisturizer that helps with the healing process. A moisturizer with active ingredients like peptides, Vitamin C, and hyaluronic acid helps to restore and repair the skin. Ingredients like Benzoyl peroxide and salicylic acid helps oily and acneic skins. Retinols and glycolics are exfoliants and help in the regeneration and renewal of the skin. 3) A Sunblock and Moisturizer in 1: I like a tinted one so that I can skip foundation too! What are “Add-on” products and should you use them? Add-on products include: serums, eye creams, toners, spot treatments, masks, scrubs. Add-on products are all fabulous and give you an added boost or super dose of active ingredients to treat issues that you may have, but are not absolutely needed in a skincare regime. They are like taking a multivitamin for your skin. Using too many products with active ingredients, such as retinols or acids (in serums, exfoliants, washes, and moisturizers all together), can burn the skin and results in making the skin become sensitive. Products are extremely active these days. Gone are the days of “this product doesn’t really do much.” What order should you apply products? 1) Cleanser 2) Serum (add-on) 3) Eye Cream (add-on) 4) Moisturizer (or moisturizer and sunblock in 1) 5) Sunblock What about scrubs and treatment masks? Scrubs and treatment masks can be used once or twice a week. Treatment masks treat a specific issue; like acne or dry skin. They are meant to feed the skin and help it heal. Scrubs are exfoliation which gets rid of dead skin build up. Remember not to scrub too hard. You will do more damage than good by breaking capillaries and creating small tears in the skin which can encourage bacteria growth. Also you cannot scrub acne away! If you are using retinols or any acids you should steer clear of scrubs as they may over sensitize your skin. A clean washcloth is enough for added exfoliation when using chemexfoliation regularly. How to determine your skin type? In the simplest of terms it is about oil production. Two questions can help determine your skin type: 1) How soon after you wash your face do you experience oiliness? 2) Where does that oiliness appear on the face? 1-2 hours after and oil is all over the face: Oily. 1-3 hours only in the “t-zone”: Oily/combination. 4-8hours: Normal/ combination. 8+ hours: Normal/Dry. Not at all: Dry skin. What are skin conditions? There are 3 skin conditions to consider. You can have one or more or all of these conditions no matter what your skin type is. 1) Dehydrated: Means lack of moisture on the skin (minus water, not oil; you can have oily/dehydrated skin). Your skin will feel tight. You may also experience a possible burning or itchy sensation. You could also produce some flakiness and the skin will feel rough and lines will look deeper. 2) Sensitive: When you use regular skin products, your face will get red, itchy, or a rash could form. Breakouts are not a symptom of sensitive skin. 3) Acne-prone: The presence of ever active blemishes; inflamed or infected sebaceous glands. If you would like more help with your skin feel free to Schedule an appointment. One Big, Tall Glass of Water for Your Skin! Summer can be hard on the skin. Between swimming, air conditioning, and temperatures in the 100’s, the summer months can deplete our skin of moisture leaving it dry, dehydrated and irritated! The Cucumber Hydration Toner is one big, tall glass of water for your skin. This amazing toner plumps and moisturizes the skin while improving the skin’s ability to hold moisture. It contains moisture binding ingredients to freshen and revitalize the skin; the combination of heavy water, hyaluronic acid, sodium PCA and other humectants provide the skin with the much needed moisture content that is lost daily. The Cucumber Hydration Toner helps also to cool and soothe aggravated skin as well as provide probiotic support to the skin’s acid mantle to strengthen its immunity. 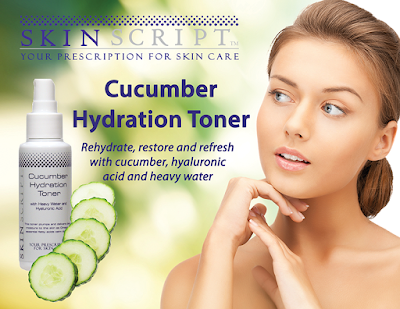 The Cucumber Hydration Toner is great for ALL skin types. Use after cleansing for added moisture. Spray the skin after make-up application for a moist, dewy appearance. Keep in refrigerator for cool splash after activities or carry on the airplane to replace lost hydration. Great for men to help soothe the skin after shaving! "There’s no such thing as a healthy tan.”-Dr. Walayat Hussain, dermatologist The Summer is once again upon us and as a skin care professional I want to remind all of you how important sun protection is. 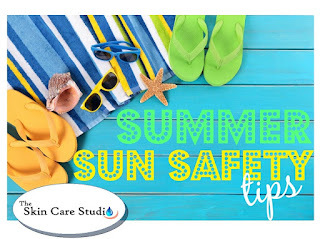 Here are a few tips to keep you safe this summer: Do NOT Burn Sunburns significantly increase one's lifetime risk of developing skin cancer, especially for children. No Tanning Avoid Sun Tanning and Tanning Beds. UV radiation from tanning beds and the sun causes skin cancer and wrinkling. Generously Apply Sunscreen Generously apply about one ounce of sunscreen to cover all exposed skin 15 minutes before going outside. Sunscreen should have a Sun Protection Factor (SPF) of at least 30 and provide broad-spectrum protection from both ultraviolet A (UVA) and ultraviolet B (UVB) rays. Reapply every two hours, even on cloudy days, and after swimming or sweating. Coverup Wear protective clothing, such as a long-sleeved shirt, pants, a wide-brimmed hat, and sunglasses, when possible. Seek Shade Seek shade when possible, and remember that the sun’s UV rays are strongest between 10 a.m. and 4 p.m. Vitamin D Get Vitamin D safely through a diet that includes vitamin supplements and foods fortified with Vitamin D. Don't seek the sun.